"I'M HERE WAITING FOR YOU"
Reflections in Black, the first comprehensive history of black photographers, is a groundbreaking pictorial collection of African American life. Featuring the work of undisputed masters such as James VanDerZee, Gordon Parks, and Carrie Mae Weems among dozens of others, this book is a refutation of the gross caricature of black life that many mainstream photographers have manifested by continually emphasizing poverty over family, despair over hope. Nearly 600 images offer rich, moving glimpses of everyday black life, from slavery to the Great Migration to contemporary suburban life, including rare antebellum daguerrotypes, photojournalism of the civil rights era, and multimedia portraits of middle-class families. 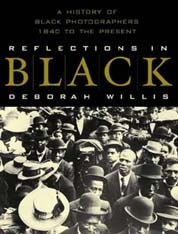 A work so significant that it has the power to reconfigure our conception of American history itself, Reflections in Black demands to be included in every American family's library as an essential part of our heritage. A Los Angeles Times and Washington Post Book World Best Book of 2000, and a Good Morning, America best gift book of 2000.